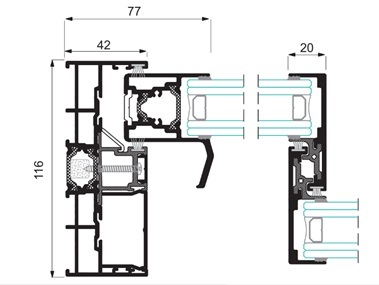 This new advance design of a thermally broken sliding system permits maximum amount of light due to minimising the visible area of the aluminium. This simple system is created to cover spaces where there is a lot of light by minimizing the frame fragment of just 9 %to 14% of the total surface. The centre junction of the frame is only shown by 20mm, with the side showing 77mm and top/bottom only showing 57mm. This gives it the possibility to lay the side, top and bottom flush with the surface around it. Furthermore, due to the sash meetings being 90 degrees in the corners, this allows it to have no mullion. The mono-channel version of this system hides the rail in the fixed area. 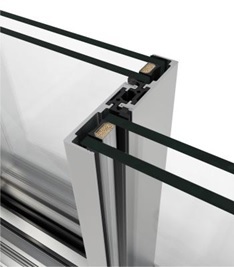 This gives it the possibility of a new type of frame for 1,2 or 3 rails which allows the addition of stainless steel rail which reduces friction allowing for a much smother opening, Additionally, this adds greater loading support for the bearings allowing it to carry up to 320kg per sash. For your security we can include a multipoint lock system by an operating rod, with or without a key depending on your request. 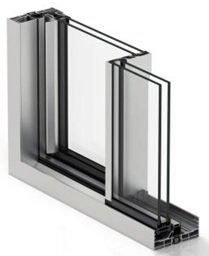 Traditional perimeter frame allows the user to easily replace broken glass.